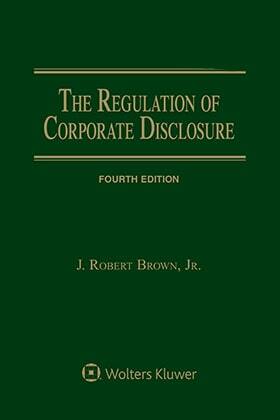 The Regulation of Corporate Disclosure is a one-volume treatise on the disclosure regime in place under the Federal securities laws. The treatise addresses the formal disclosure process (periodic reports, MD&A, Regulation FD), the informal disclosure process (press releases, social media, discussions with analysts), and the application of the antifraud provisions to these communications. The treatise includes chapters on scienter and materiality, and also addresses communications with and disclosure obligations to shareholders. State disclosure obligations of the board of directors under its fiduciary obligations to shareholders.